Save AED 164 (70.09%) – Earn 7 Shukrans What is Shukran? Shukran is the Landmark Group’s award-winning loyalty programme in the Middle East, which allows you to earn Shukrans when you shop any of our brands. Versatile in nature, this rocker offers three different reclining positions to provide maximum comfort to your little one. 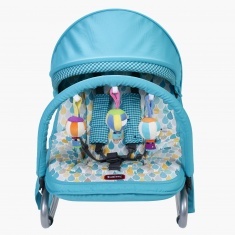 It features a three-point adjustable waist harness to prevent your kid from falling from the rocker.